I really like Hood. They make music that varies between frenetic energy and thoughtful reflection, but always has a vaguely melancholy undertone. Hood also have recorded in a wide variety of "styles": they have some lo-fi stuff and some really smooth studio work, often on the same album. They have also used some electronic sounds on some of their work, smoothly blended with acoustic guitars and pianos. I guess what i am implying here is that Hood are constantly changing. They are not a band prone to stand still for too long -- they want to explore and do new things. It's never a dull moment. So what, i wondered, would Hood do differently this time around? The release prior to Cold House was their brilliant Home Is Where It Hurts EP, which blended lo-fi rock, dub, and glitchy electronica seamlessly. Where would Hood go next? What new thing would Hood bring into their sound for this new album? I urge you to approach the answer with an open mind. And that answer is: rap. There are two guest rappers named Dose One and Why? (affiliated with something called "Anticon") who add vocals to a few tracks, and who supposedly helped out with the production. I know that i, for one, was discouraged when i first heard this. Rap is, well, it has never lived up to it's promise, as far as i am concerned. From what i hear, it takes music and strips it down to to things: a beat and an ego. I listen to rap and i think, "Where's the melody?" Maybe i just don't get it. But then again, i am a thirty-something white guy who grew up BEFORE rap became popular. Maybe since i was never exposed to it during my important formative years, i never grew to appreciate it. Or maybe rap simply is mass-marketed egotistical crap. I dunno. Okay, so i am over-generalizing here. I have heard rap music that i enjoyed -- usually in a live setting. However, i have never heard of "Anticon" so i feared the worse. My fears were unfounded: Anticon are apparently not "Puff Daddy". They do not make genericized "beat and voice" based music for the masses. 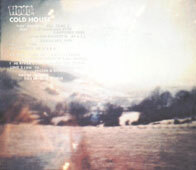 I don't know what they do, really, but if Cold House is typical of their work, i would like to hear more. The presence of Dose One and Why? is subtle -- it is another color on the complex musical pallet that Hood use. I also think that it is well used -- the subtle rapping adds a nice touch to the music. I think it helps that Dose One and Why? have melancholy sounding voices that blend in well with Hood's flurry of minor chords and slow beats. Three tracks feature the rap. The rappers come in for some background vocals during the albums's opener, They Removed All Trace That Anything Had Ever Happened Here. The album ends with the rap lines deconstructed and then restructured in layers on You're Worth The Whole World. Both of these tunes contain pretty good use of rap as an accompaniment. To give the fish something to pray to. Doesn't want to be photographed. A lovely image, and perfectly in keeping with the introspective rainy day spirit of Hood's music. What makes this bit even better is that one of the rappers does lead, while the other echos the words in an eerie falsetto. It's creepy and beautiful, all at once. This whole track is. Some of the other tunes don't use the rappers, but still stand out. Lines Low To The Frozen Ground is a delicate jazzy tune with deep bass riffs. The Winter Hit Hard starts lightly, then becomes a swirling mess of rich electronically manipulated lo-fi pop. Enemy Of Time sounds almost classical, with strings, horns, and piano trying to drown out the guitar, bass, and drums. However, there are a two tunes that i avoid on the album, and fortunately they are back to back. This Is What We Do To Sellout(s) stutters and spurts so much that it not only out-Autechre's Autechre, but it also makes me wonder if my CD player is eating the disc. The River Curls Around This Town does the same thing. I suppose that this type of intense cut-and-paste electrionica is something else that i "don't get". The problem is, this is the idea carried to an extreme, while if subtly used i enjoy cut-and-paste. You're Worth The Whole World and The Winter Hit Hard use the same theory behind the electronic restructuring of the music, and those songs work. They are enjoyable and do not make me think that my CD is destroyed. So maybe it is the theory taken to the extreme that i "don't get". Maybe. But that's only 2 out of 10 songs. On the whole, this is another well done album. Hood continue to impress. I wonder what new twist they will put on their sound for their next album?